Located on the east side of Pacific Highway between B and C streets, The Grande is comprised of two 39 story towers, each with 221 residences. Designed by Perkins & Company architecture, each of The Grande towers were constructed in a triangular shape, lending each residence the opportunity for beautiful views of the bay and the San Diego skyline. Within these towers residents will have access to a sauna and steam room, 80-foot outdoor swimming pool, a barbecue area, a party room, fully furnished meeting room, bicycle storage and subterranean parking. The residences at The Grande offer a variety of features including marble or limestone tub and shower surrounds, Kohler fixtures, customized French doors, hardwood floors and contemporary styling. 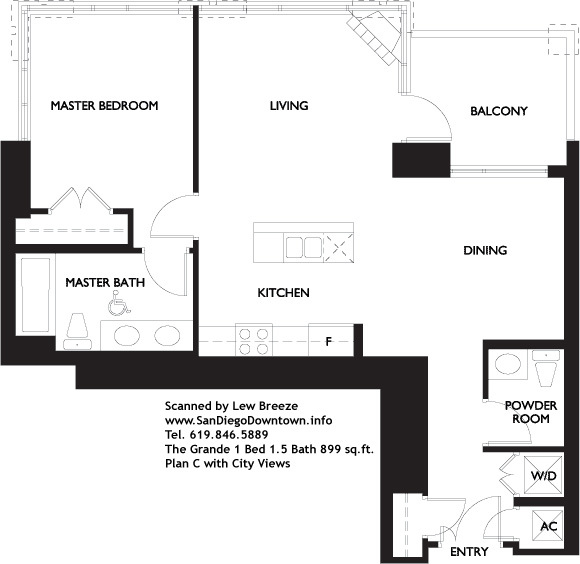 A variety of floor plans are also offered. Two bedroom townhomes start at 1,497 to square feet. Two bedroom townhomes with den range from 1,879 to 1,980 square feet. One bedroom residence are around 889 square feet. Two bedroom condominiums start at approximately 1,336 square feet and with den range from approximately 1,624 to 1,945 square feet. Monthly homeowners fees range from the mid 600s to the 700s. Want to know more about The Grande?